No turtles were harmed during this post. Water temp 49.8 deg F! The weather dot com said there was a chance the temperature would peak at mid sixties and the forecasts had a leading digit of seven. I decided it was worth the risk to drive to the Rivanna at the dam near 29 N to see if there were any crappie or if we were really lucky smallmouth fish around! The water temps were a little warmer than I expected, but they were probably still too low for good smallmouth fishing. Harry Murray emails a monthly report on trout and bass fishing which is always a good read. 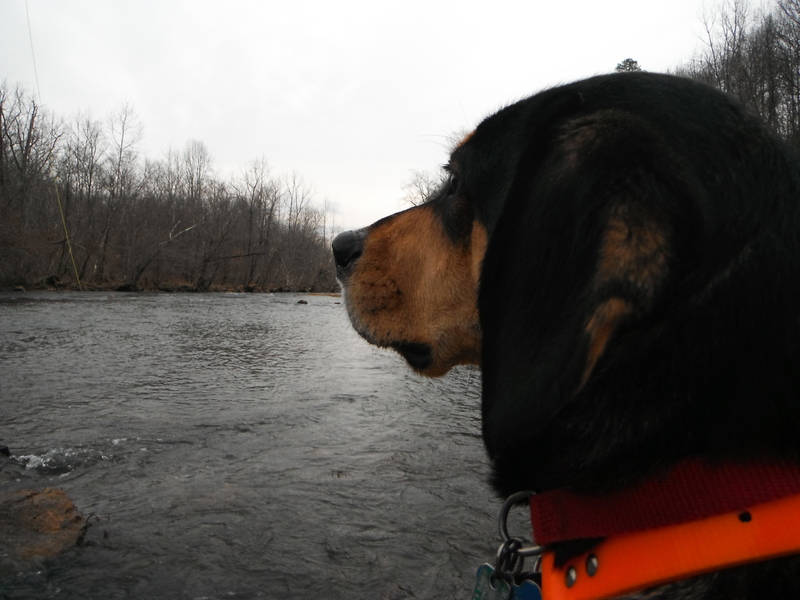 His most recent edition states that the smallmouth fishing may pick up when the water temps hit 54 degrees. I am anxiously awaiting those temperatures. In addition to the possibility of a bass on the line, 50-55 degrees in the coastal estuaries triggers the shad run. 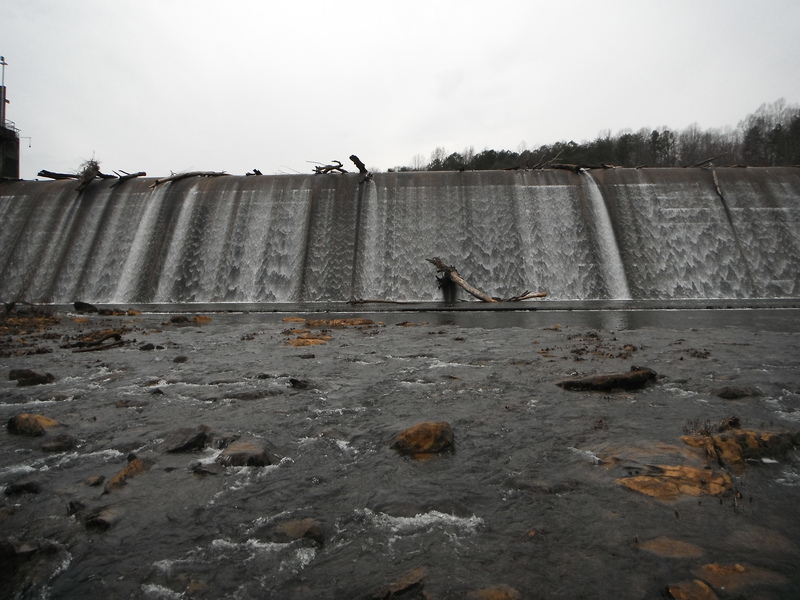 There are a couple of pools at the base of the dam that consistently held spawning crappie last year. They are steep drop-off pools with moderately rocky bottoms directly adjacent to a large riffle. On a couple trips last year, I caught a fish on almost every other cast of a slowly stripped clouser minnow. No crappie on the line, but I managed to foul hook/entice this little gem. Tucker was very well behaved on this trip. He had a three mile run before we set out for the river. He also spend the entire time fixated on a pair of mallards about one hundred yards from us. Can you imagine if one of those trees became dislodged! The dam pictured here provides the final obstruction for migrating American shad. By my crude google map estimation, this is the terminus for their 120+mile migration from the mouth of the Chesapeake Bay. Every time I pull one of these 2-5 pound wonders out of the river I’m humbled by their effort. Today the drive to Hampton Roads takes us a couple of hours. For thousands of years these fish have made that same journey with no help from internal combustion engines. It’s neat to think that just a short month or so prior to your flashy metal offering they were chasing baitfish in the Atlantic ocean. Helps to put life in perspective. Speaking of history and the Hampton Roads area, the annual shad planking event will have some serious implications in this election year. The waters are getting warmer. The peep toads are getting louder. March is finally here. Springtime fishing is coming!!!!! 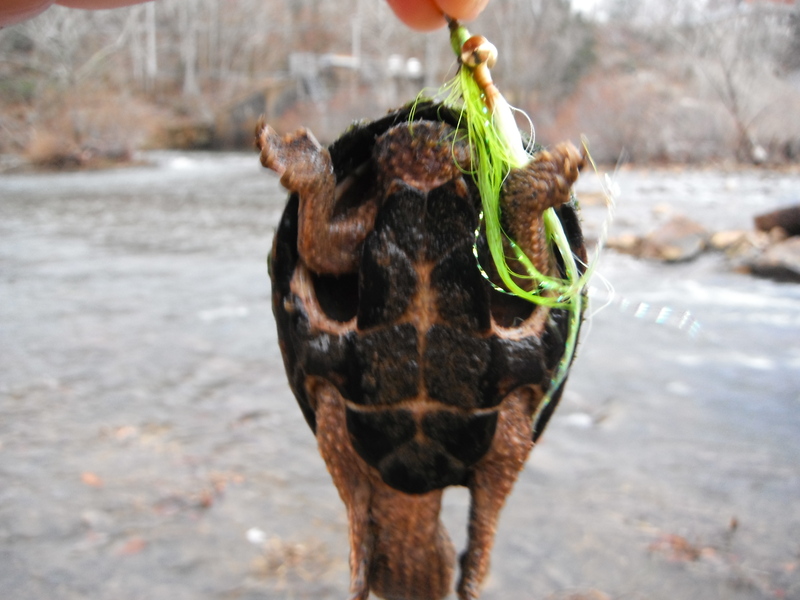 This entry was posted in Fishing Report and tagged clouser minnow, crappie, fishing report, Fly fishing, Rivanna river, shad, smallmouth fishing, tucker, turtle. Bookmark the permalink. 4 Responses to No turtles were harmed during this post. riddle me this – why do they call them crappies? Then shouldn’t it be pronounced “crap-ee-yeh”?